The main manufacturers of bears in Austria were Fechter, Schenker, Schwika all based in Graz, SAF based at Mittendorf [Northern Styria near to the Salzburg area] and Berg in Fieberbrunn in Tyrol. I have in my collection many examples from these makers and you will be able to read more about each one, complete with photos, in detail by following the links below. In the miscellaneous section there is a small amount of information on lesser known makers. Austrian bears appear to have been a post WW2 industry although I’m sure that bears must have been made there pre-war possibly in cottage industries. In all my searching I only found one very old bear which may have been made there [see picture]. 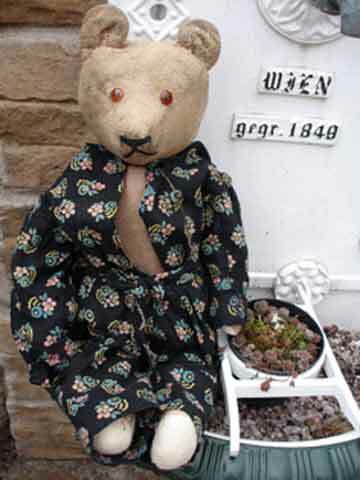 This old lady is of the ‘Sonneberg’ style of bear. She was bought in Vienna wearing the clothes she has on and round her neck is a wire with a seal bearing the imprinted letters 'S & E Vienna’. I can’t be certain if this relates to the manufacturer or the seller and have not been able to find either with these initials. Most of the pre-war bears I found there for sale were of German origin. I very occasionally found post-war English teddies; Chad Valley and Lefray being the only vintage makers marks I saw.